This ASCD Study Guide is designed to enhance your understanding and application of the information contained in Schooling by Design: Mission, Action, and Achievement, an ASCD book written by Grant Wiggins and Jay McTighe and published in July 2007. You can use the study guide before or after you have read the book, or as you finish each chapter. The study questions provided are not meant to cover all aspects of the book, but, rather, to address specific ideas that might warrant further reflection. Most of the questions contained in this study guide are ones you can think about on your own, but we suggest forming a study group with others who have read (or are reading) Schooling by Design: Mission, Action, and Achievement. In addition to discussing the questions from this Study Guide, readers are invited to try one or more of the Ideas for Action found at the end of each of the book’s chapters. Chapter 1: What is the Mission of Schooling? What do you believe should be the mission of schooling? Compare your ideas with those presented in Schooling by Design and those of your colleagues. Does your school have an explicit mission statement? If so, to what extent does your mission statement describe the desired results of schooling (learner outcomes) as opposed to what the school will provide (inputs)? Does the current mission statement need to be updated or revised? What changes or improvements are needed? To what extent do our practices and structures align with the mission? Are there any areas where our actions are out-of-sync with our stated mission? To what extent do staff, students, and parents know and agree with the mission? How might you better publicize the mission for the various constituencies? Chapter 2: What Should Curriculum Accomplish? The authors suggest that curriculum writers in all subjects should approach their work like athletic and performing arts coaches. Do you agree? What implications would such an approach have on our curriculum? To what extent does our current curriculum “spiral” around a set of important ideas and essential questions in the various disciplines? What types of cornerstone assessments are needed to provide evidence of learners achieving our mission, program goals and standards? Do we have curriculum-embedded assessments that call for authentic application and transfer (as opposed to “practice” tests that mimic the format of the state tests)? To what extent do teachers use diagnostic (pre-) and formative (on-going) assessments to inform needed instructional adjustments? Are these assessments provided within our curriculum? Chapter 3: How Should Curriculum Be Re-Formed? How does your current curriculum match the 10 curriculum components described in Schooling by Design? (Refer to the chart on page 109.) What are the areas of greatest curricular strength? What areas of our curriculum most need improvement? Has your department or grade-level team “mapped” the curriculum? Why or why not? If so, what are the benefits? To what extent does your department or grade-level team use common rubrics for assessing student work? Why or why not? If so, what are the benefits? Does your department or grade-level team have anchor samples of student work? Why or why not? If so, what are the benefits? Chapter 4: How Should Teaching Be Appropriately De-personalized? Do you agree with the authors about the need to depersonalize teaching? What should be personal about teaching? Why? What areas of teaching should be depersonalized? Why? With which of the learning principles presented on pages 113–144 do you agree? Why? Are there any with which you disagree? Why? Are there any important learning principles missing from the list? Can you give specific examples of current practices (in your classroom or school) that reflect these learning principles? Can you give examples that violate any of these principles? Overall, which of our current practices are most aligned with these learning principles? Which of our current practices are most out-of-sync with these learning principles? In what ways might having common rubrics and agreed-upon performance standards help to de-personalize teaching? Examine the basic job description for the teachers in your school and district. Is there a difference between the job description and what teachers in the school or district do everyday? How can the job description be brought in line with the mission and vision of the school or district? To what extent do teachers in your school or district see their job as teaching for understanding and transfer (as opposed to covering the textbook or preparing for state tests)? To what extent do teachers effectively teach for understanding and transfer? The authors suggest several potential teacher misunderstandings about their job (beginning on page 144). Do you agree that these misunderstandings exist in your school or district? If so, how might you address them? Chapter 6: What Is the Teacher’s Job When Not Teaching? Does your school or district have an explicit job description for teachers? What roles and duties are expected of teachers when they’re not in the classroom? The authors suggest several non-teaching duties, including reviewer of curriculum, examiner of achievement results, troubleshooter, collaborative improvement planner and continuous learner. Do you agree that these are important non-instructional roles for teachers? To what extent do teachers in your school or district engage in these actions? How does the staff in your school or district keep current and grow in their teaching skills and knowledge? What might be done to encourage greater professional learning and action research by educators? Chapter 7: What Is the Job of an Academic Leader? Has your school or district defined the role of academic leaders? What responsibilities have been identified? In their job roles, what areas consume the most time and effort (e.g., mission and vision, curriculum, data collection, monitoring results, improvement planning, staff appraisal, professional development)? Should academic leaders redirect their efforts? If so, where and why? The authors identify a set of responsibilities for academic leaders related to the curriculum (pages 175–177). To what extent do your (school or district’s) academic leaders take on these responsibilities? What areas need greater attention by leaders? What kinds of professional development does your school or district typically sponsor? Have you solicited information from stakeholders about professional development opportunities or different formats that they would like to try? How does hiring take place in your district? Are stakeholders involved? How can your school or district become more involved in supporting and mentoring new and experienced teachers? According to the authors, an academic leader’s job also involves establishing structures and policies and directing resources to help achieve the mission and program goals. To what extent do the current structures, policies, and resources support our mission and program goals? What structural or policy changes may be needed? How might resources be more effectively allocated in support of our mission and program goals? Chapter 8: How Should Backward Design Apply to School Reform? How might you apply the 3-stage “backward design” process and the template on page 206 to your school and district’s reform efforts? The authors caution against “rushing to action” before carefully defining the problem and the desired results, and making efforts to develop understanding on the part of staff and other constituent groups. Do you agree? Why or why not? If so, what are specific cases in your school or district where these ideas would apply? What areas (e.g., staff development, school improvement planning) would benefit the most from “backward design”? The authors highlight the importance of gathering data as feedback on your reform efforts so that needed adjustments can be made. Given a specific reform initiative, how might you collect data for feedback and how will adjustments be implemented? Chapter 9: What Are the Desired Results of School Reform? The authors suggest performing a gap analysis to identify the disparity between your desired results and your school’s reality. What gap areas are most critical to your school or district? What steps are needed to address the gaps? A set of essential questions for educators are provided in Figure 9.4, page 225. Which of these apply to your school or district? What responses do you have to those questions? What other essential questions should be examined in your setting? The authors suggest that school leaders help staff and others (e.g., Board of Education, community) see the connections among various initiatives. What are the major initiatives operating in your school or district? In what ways are they connected? Are any at odds with each other or disconnected from acknowledged needs? How might we help people see fruitful connections among the various school improvement initiatives? Chapter 10: What Evidence Should We Collect? The authors challenge educators to “measure what matters.” To what extent are we collecting evidence about what we value, such as our mission? Are we only collecting evidence about those things that are easiest to measure? The authors suggest assessing staff according to their readiness, willingness, and ability to implement needed school reforms (Figure 10.4, page 237). To what extent is your school staff ready, willing, and able to undertake an important new initiative? What can be done to more fully support them in this arena? Where do the classroom practices in your school or district fall along the continua presented in Figure 10.3 on page 236. (You may need to sort the data according to department or grade level to get the most meaningful results.) What are the areas of greatest strength? What are areas needing most improvement? Chapter 11: What Actions Should We Plan? Do you agree with the authors’ eight guidelines for planning school reform actions (pp. 242–246)? Are there other guidelines that should be included? Can you give specific examples of these guidelines in practice? (a) diagnose before prescribing, (b) go with talent and interest, (c) plan carefully for inevitable negative responses, (d) use intrinsic and extrinsic rewards, (e) minimize disruptions, and (f) practice and model what you preach. What specific ideas do any of the guidelines suggest? How do the WHERETO elements (explained on page 246) relate to your current school improvement efforts? What practical ideas for school improvement do the WHERETO elements suggest? Leaders are likely to hear concerns about how much time and effort school reform actions will take. What objections (“Yes, but . . .”) are you likely to hear regarding a needed reform or initiative? How will you respond? The authors contend that education is beset by habits and “unthinking routines that imprison us and make us defensive” (p. 257). Are there such “unthinking routines” operating in your school or district that are getting in the way of school reform? How many of the school practices listed on page 259 are evident in your school or district? Which of the identified practices are most significant inhibitors of needed change? How might you confront and change those practices? 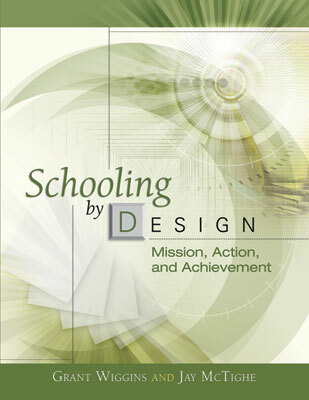 Schooling by Design: Mission, Action, and Achievement was written by Grant Wiggins and Jay McTighe. This 287-page, 8 1/2" x 11" book (Stock #107018; ISBN-13: 978-1-4166-0580-5) is available from ASCD for $23.95 (ASCD member) or $30.95 (nonmember). Copyright © 2007 by ASCD. To order a copy, call ASCD at 1-800-933-2723 (in Virginia 1-703-578-9600) and press 2 for the Service Center. Or buy the book from ASCD's Online Store.